In recent months the next version of Moodle has been beta released to the general public on the Moodle website. Moodle is an open source product and a new update to the currently 1.0 is always available. There is almost a weekly update that a school can implement with a new feature. A team who run the Moodle website have been working on the new 2.0 version of the product. This is currently in Release Candidate 1 and does not have all the features for back end services. One of these is the ability to use a Microsoft SQL Server. Since April 2010 I have released 3 different whitepapers on how to implement Moodle on Windows Server 2008 both x86 and x64 and also building a high availability Moodle install on a Windows environment. 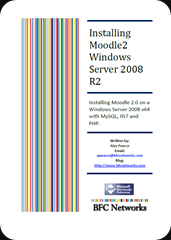 Now a release of Moodle 2 is available, I have write a step by step guide on how to implement Moodle 2 on a Windows Server 2008 R2, IIS, PHP, MySQL. Firstly, thank you for addressing the problem of Moodle 2.0 installation on Windows server. this is the first time I’ve ever left anyone a reply. Your instructions are clarity itself and if I had a bit of savvy I’m sure I could work around my problems. 2. I can’t dedicate my server exclusively to Moodle: I can add new websites under ‘default’ but when I follow you instructions, (not surprisingly?) the install can’t find the files. 3. When I create folders in C: ie Moodle and moodle data I get the startup page then receive a PHP error “database driver problem detected. The site admin should verify server config [[sqlsrv extension not present in php]]” although I checked and the extension is present as you directed. was fine but the browser couldn’t find phpinfo.php. Sorry if I sound like a complete plonker…(?) but nobody else in my school knows any more than I do (I’m an English teacher!) and Moodle 1.9 isn’t an alternative for a variety of reasons (mostly to do with problems organising student groups and linking to existing MSSQL server). I’m sure you’re incredibly busy but I would appreciate any suggestions you might make. (And, we can’t hire someone who knows his bum from a hole in the ground…I’m all there is…the one-eyed man in the valley of the blind. I created my very own moodle using your instruction. 1st it took me a lot of failure but, when I figure it out the testphp.php has another extension (testphp.php.txt) and config.php.txt) so I used dreamwaver to find out if there was wrong on the code. and yet there is, so I renamed it. and now it works properly. Thanks for the comment – you should notice in the notes that you can do this in Windows Explorer and checking ‘Show file extensions’. I am also having trouble getting the phpinfo.php to show up. I’m wondering if the instructions were missing a step to, perhaps, rename testphp.php to phpinfo.php? Thank you for the step by step instruction. I could get the testphp.php running, but not the phpinfo.php. Most important, I could not finish the Moodle installation in the end. Wonder if anybody found the solution by now. Thanks. This is actually incorrect. Since you had us move the moodle files into c:inetpubwwwrootmoodle the address should actually be http://127.0.0.1/moodle. Doing it the way you mention just takes you to the default IIS page. There were some known problems with using Moodle 2 and SharePoint 2010. The file extensions were being dropped and SharePoint will block these. Has this problem been resolved? Followed your instructions exactly but as soon as I got to the first test stage: http://127.0.0.1/testphp.php I eas presented with HTTP 404 Not Found. I changed the file type from .txt to .php. Can anyone help or suggest what may be wrong? Quite new to this. Any ideas on the best methodology to upgrade? I installed the web installer platform version a year or so ago but I need to upgrade to at least version 2.4 of Moodle. Should I use the standard version i.e. backup the moodle and moodledata directories, rename the moodle directory and unzip the new version or should I download the newest web platform installer (2.5) and rerun it? That manual described in the first post is exactly what I’m looking for. Where can I get this manual? Do you still have the guide for installing moodle 2 on Windows server 2008 r2? I’ve been tasked this job but it doesn’t seem straightforward. Unfortunately your link no longer works, but it is rather an old blog entry. If you still have it, please can you email it to me. If you still have the above guide to install moodle on a windows server, please can you email it to me as you link no longer works.